There have never been so many international teams among the Top100 of Ajujaht. This season we have brought together participants from eleven different countries – from the French and the Brits to the Vietnamiese. There are even teams that are completely international, without any Estonian members. This applies for the Latvian team HackMotion as well as for the Locolo team from Moscow. Locolo is a mobile app that offers a sharing platform for its users – you can rent everything in your possession. Locolo changes the way how people consume and own things. Currently useable in St Petersburg and Moscow, its founder Artyom Ignatyev told that Ajujaht is the first startup-competition they’re taking part in. “It’s very nice to hear, that we’re in the Top 100 now. We heard about Ajujaht through Facebook and thought to give it a go. Now we have to take a trip to Tallinn into our agenda, I guess,” said him. Marion Raudsepp from Enterprise Estonia, the initiator of Ajujaht told that the growing number of the international teams participating in Ajujaht is a sign, that the Estonian startup system has the ability to push the boundaries. “In the long run it is Estonia’s wish to offer a stimulating working environment for the start-up’s, where they can take they’re idea to the next level. It’s very nice to see, that today we are moving towards that and I hope that all our teams year will succeed,” said Raudsepp. There are already four teams who have ensured themselves a spot in the Top30 through different hackathons – Wallstreet, MARKUS, TempID and MovePrep. Rest of the teams will have to put they’re idea and they’re presenting skills to test in front of the jury in the end of November. Mart Maasik, the head of SEB Business Innovation emphasized that all the teams will have to set they’re messages straight. “Teams will have to show a certain amount of persuasiveness. They will have to make it clear, what kind of problem they are solving and how they will do that. It does not matter, whether they will do that in Estonian or in English,” said him. Sami Seppänen, the CEO of Elisa said that all the ideas submitted to Ajujaht are inspiring. “There are some really world changing ideas, which have the capability to start they’re business in Estonia as well as elsewhere in the world. This season brought together ideas, which are targeting a very specific problem and especially the kind of problems, which do not have a solution today. 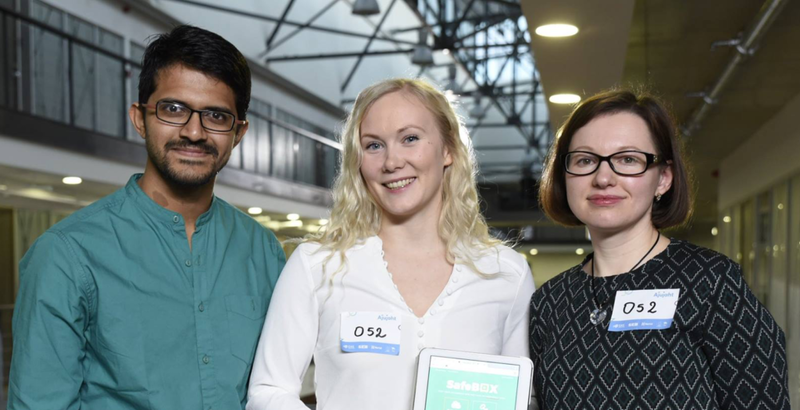 I see, that Ajujaht represents the future of innovation with a moto – “Be the change, you want to see in the world,” said Sami Seppänen. For an overview of the Top100 teams click here. The initiator of Ajujaht is Enterprise Estonia, its partner SEB Bank and sponsor Elisa. In addition to the mentioned, the supporters of Ajujaht include Delfi, Estonian National Broadcast (ERR), Nasdaq, Tehnopol, the City of Pärnu, the City of Tartu, the City of Tallinn, Võru County, The Parish of Viimsi, National Foundation of Civil Society, Ülemiste City, Tartu Centre for Creative Industries, and Levira.